Bert on left, Ernie on right. Our very first 'race' - almost seven years ago! Bert isn’t related to my other Alaskan Malamutes - Tinker, Ooky or Ernie - and came from the USA. He is a neutered pet - and the best reason I can think of as to why to 'health check' pets. Most of what is wrong with Bert is easy and cheap to treat - if the diseases are found early. Bert has 'a bad coat' (coat funk or alopecia x) and there is no treatment for the coat funk. He is hypothyroid and was a bilateral cryptorchid though there is treatment for the hypothyroidism. He had cataracts and lens luxation, as well. He was diagnosed with Cushings at the end of 2011, after several tests over the years coming up 'negative' and ultimately lost his fight at the March 2012. He undoubtedly had a few things we never 'knew' about. Bert is almost entirely Wakon Alaskan Malamutes in pedigree. While he isn’t a ‘well dog’ he is most definitely a fun, loving malamute. He was one of the most sensitive, gentle dogs you could ask for. Fortunatley, modern Alaskan Malamutes can live with coat funk. He can't be left outside in the cold or rain but he can happily live in the house. 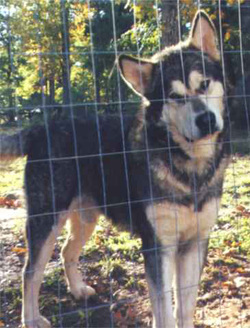 He was my third Alaskan Malamute and arrived almost immediately after Tala died, as Ernie was left with no companion. Bert and Ernie were inseparable, shared their dinners, bones, and space. Ernie always looked out for Bert. Bert is one of a kind. Prior to a cruciate ligament injury in 2010 he was working toward some major weightpull achievements. Bert won every pull in Ontario the only year he was taken out to every event, in 2008/9, (he missed some events the years before - but won many of them). 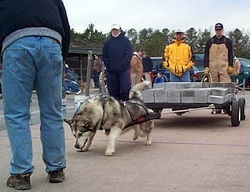 He was pulling around 2000 pounds and had won top pull at several pulls. He did some pack walking, some agility and sledding, too. Unfortunately, he damaged his cruciate ligament playing with Tinker. Most, if not all, of the diseases Bert has are common health disorders of the Alaskan Malamute but that are easily detected. PLEASE take your pets for basic health clearances - hips and eyes - hearts and thyroid if you can - to be sure nothing is wrong! If you are content to buy and Alaskan Malamute from someone doing just the barest minimum of tests - which are 'hips and eyes' - then, great! I truly hope your puppy doesn't end up with one of the other diseases their parents, or the pups, COULD HAVE been checked for! Alaskan Malamute puppies can have physical certifications against eye and heart disease BEFORE they even leave the breeder! DNA testing can be performed at ANY age, including 'newborn'! Click here to learn about physical and DNA testing for disease in the Alaskan Malamute. Ernie, left and Bert, right chew a bone together.